Vigorous vines that climb like pole beans produce delicious bright green pods up to a yard long with a nutty flavor, resembling asparagus. May be cooked like green beans or stir-fried. Ideal for freezing. Shell mature pods for drier beans. 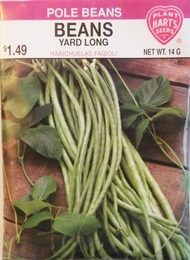 Pole beans may be grown on a fence or trellis and the seed planted in a row. Thin the young plants to 8 inches apart. For highest quality and yield, pick pods when young, about 4-5 inches long.